﻿﻿﻿Atlanta, Michigan. January 30, 2011. The 2011 U.S. rally season got underway this weekend with Sno*Drift Rally, the opener of the Rally America National Championship. As the rally cars sat at the starting line for the opening stage Antoine L’Estage, David Higgins and Dave Mirra were all tipped as possible favorites for the overall victory. But in just a few short stages, the predictions for the overall winner were quickly thrown out the window. As others retired around them, the father and son team of Travis and Terry Hanson would throw down some remarkable times on the opening stages of day one, thus opening a large margin that they would not concede all the way to the finish line. But no less remarkable was the drive put in by Joseph Burke, who managed to keep Team Subaru driver Dave Mirra at bay right down to the penultimate stage. Burke showed great maturity for a young driver in salvaging a podium finish rather than throwing it off on the very icy conditions. Going into Sno*Drift most had expected this to be a battle between the 2010 Rally America Champion Antoine L’Estage and Team Subaru driver David Higgins for the overall title. L’Estage and his regular co-driver Nathalie Richard would indeed open big. A string of stage victories put Antoine 20 seconds ahead of Higgins after 3 stages. But a rare misjudgment by L’Estage on SS4 would see him stranding his Rockstar Energy Mitsubishi on a snow bank. Antoine would eventually get back on the road with the help of another competitor but the damage was done. The car overheated and forced his retirement. David Higgins, a native of The Isle of Man, would take over the lead of the rally, but it was to be a short lived run for Subaru’s new driver. Engine failure on SS6 would end his run. With L’Estage and Higgins sidelined, the rally lead was taken up by Travis Hanson who had started fourth on the road. 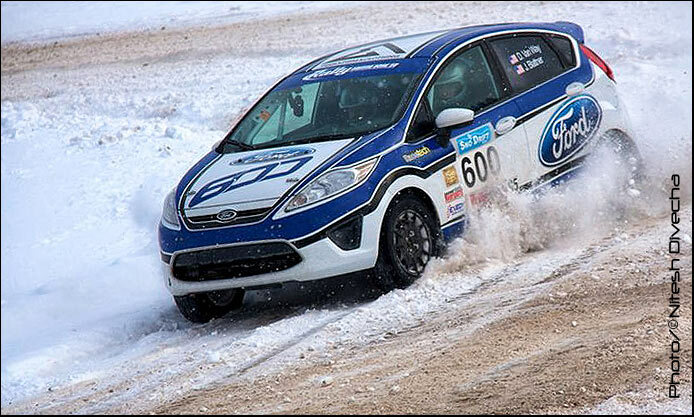 Travis, who is a native of Michigan, definitely has some mad driving skills on snow and in icy conditions. At the end of the final stage on day one it was Joseph Burke, Arkadiusz Gruszka, Roman Pakos and Dave Mirra jostling for position behind Hanson in his 2007 SP Class Subaru STI. Moving into day two and running first on the road Travis Hanson and his co-driver father, Terry, would settle into the groove focused on a clean run towards the podium. The chase was on. 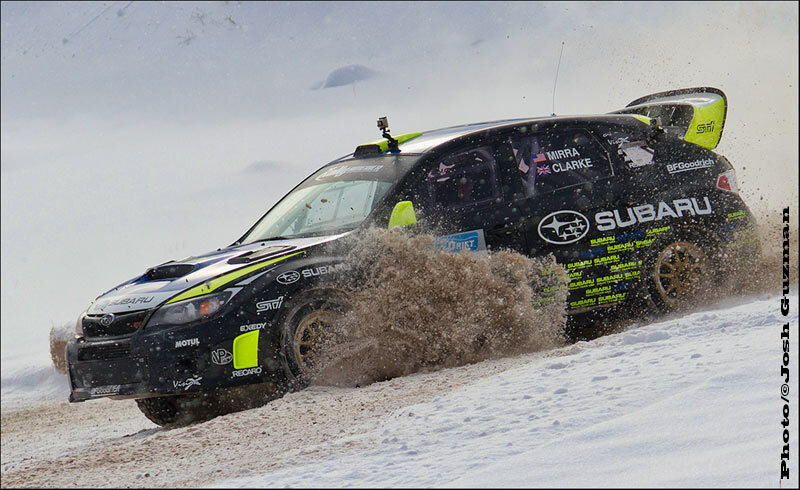 For Team Subaru USA their hopes of a podium finish now lay in the hands of Dave Mirra and his new co-driver, Marshall Clarke from Enniskillen, Ireland. Arkadiusz Gruszka started the day in third overall, but would crash out on SS8, the opening stage of the day. The battle for second and third podium positions was clearly going to be between Joseph Burke and Dave Mirra. This was only the second time rallying on snow and ice for Burke, but the young driver proved his worth and the good judgment to know when he was driving beyond his experience on these tough conditions. The battle for the 2WD title was a case of what could have been for Duplessis. 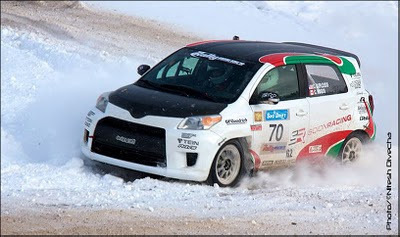 Chris Duplessis, who is back with a 2010 Scion x-D for 2011, had opened a three minute gap over Dillon Van Way in the 2011 Ford Fiesta after just the first six stages. But SS7, the same stage that caused problems for Burke and Mirra, would slow Duplessis’ charge. A puncture and a loose light pod would cost him 10 minutes. Heading into day two, despite his loss of time, Duplessis was still in position for a solid third on the podium. Much like Mirra, he could have settled for third, but driving “easy” is not in these guys DNA. Erasing 10 minutes over some 70 horrendously icy stage miles seemed like an impossible task. 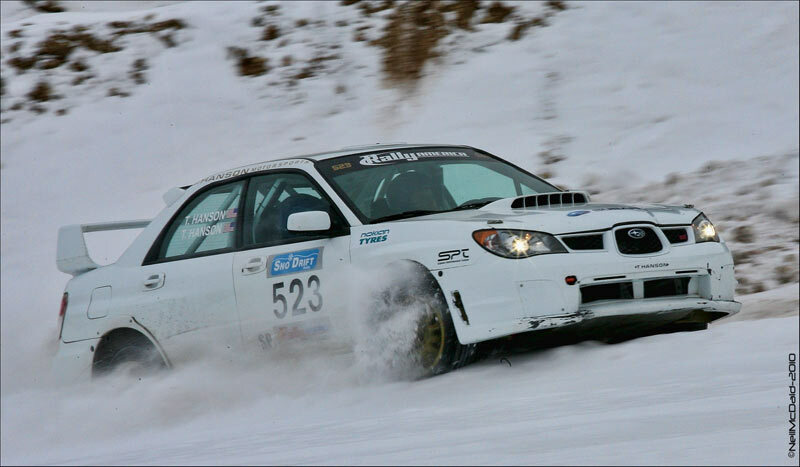 As the clocks stopped at the final time control on the last stage of the 2011 Sno*Drift Rally, Duplessis had come so very close to grabbing the top spot. Not to take away from Dillon Van Way’s overall 2WD class victory in a bone stock 2011 Ford Fiesta (with the exception of some upgraded suspension bits and a roll cage, and a Quaife LSD of course), but Duplessis had run so hard over the last stages of day two that he had closed to within just over a minute from snatching the overall podium. Chris Greenhouse rounded out the 2WD class podium in third. a massive comeback on day two. Erik Zenz and co-driver Dave Parps in an open class, Mazda 323 won the Drift Regional Rally on Saturday, posting a time of 1 hour 17 minutes and 14.2 seconds. 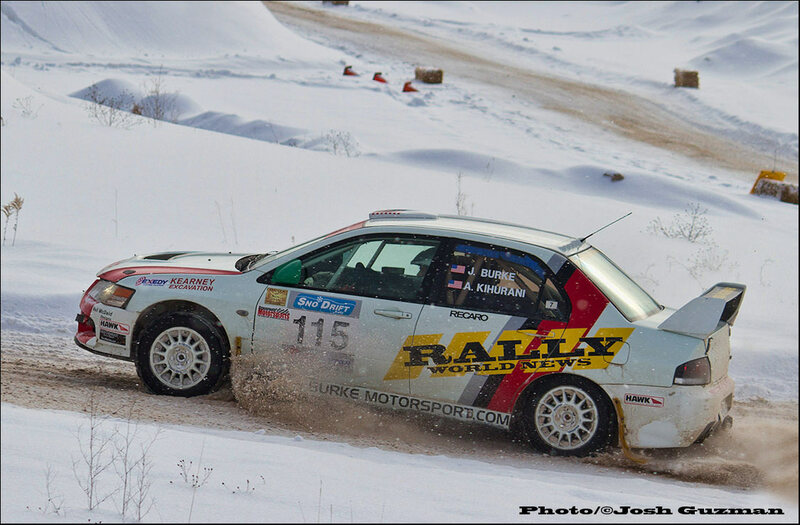 Zenz finished 22 seconds ahead of Henry and Cynthia Krolikowski in a Subaru, winners of Friday’s Sno* Regional. Grabbing third place was Matt and Andrew Bushore in the POS VW Jetta, finishing 6 minutes behind Zenz. Looking forward to Rally of The 100 Acre Wood, round two of the Rally America Championship, we expect the battle at the front to pick up between L’Estage and Higgins. It will be interesting to see if Hanson can keep his pace from Sno*Drift on the fast flowing stages in Salem, Missouri, will Mirra and Burke take up where they left off. 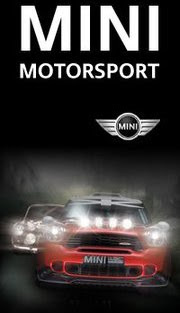 Without a WRC event that weekend, will we see the defending champion Ken Block make an appearance to defend his title? Will Ramana Lagemann also get back in the mix? With both Ford and Scion, now showing some backing in the 2WD class, it will be interesting to see which of their drivers can become “A Star in a reasonably priced car”. We expect Duplessis will be back on a mission in the Team Scion Racing x-D looking to claim his first overall victory in 2011. Van Way is expected to get an upgrade by possibly adding a Turbo to the Fiesta, it will all be needed to match the pace of Duplessis. We do expect to hear some more exciting 2WD news in the very near future.